Substitute James Wilson bagged the winner as Albion made it back-to-back Championship wins with a 2-1 home success over Huddersfield this afternoon. It was a first Amex success for Brighton since a 3-2 win over Charlton in December and the first time they had netted at home since then. With fourth and fifth-placed Derby and Burnley not in action until Monday, the victory means Albion moved up to third in the table. Bobby Zamora fired the home side ahead following a fine breakaway on 30 minutes but the Terriers levelled courtesy of a Harry Bunn header two minutes into first half stoppage-time. 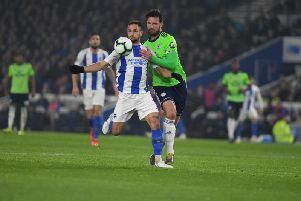 But Albion were not to be denied and Manchester United loanee Wilson headed home with 24 minutes to go as Albion took all three points. Albion were fortunate not to see themselves fall behind after seven minutes. Joel Lynch’s flicked header from Emyr Huws’ corner looked destined for the bottom corner but Jamie Murphy headed clear on the goalline to keep the score at 0-0. Jamie Murphy was a little unfortunate not to fire Albion ahead on 27 minutes. Fine work from Beram Kayal saw him tackle then send Murphy away, the wideman beat two Huddersfield defenders, only to sees his strike flash across the goal face. Brighton were ahead just four minutes later, though, as Zamora bagged his seventh of the season. A fine breakaway from a visitor’s corner saw Kayal collect the ball, send Anthony Knockaert clear before the Frenchman found Zamora and he volleyed home. Nahki Wells should have levelled things up a minute before the interval. Albion failed to clear their lines and Mark Hudson’s header found Wells, who beat Connor Goldson but could only blaze his close range strike over. That miss did prove costly, though, and the Terriers made it 1-1 two minutes into first-half stoppage time as Harry Bunn headed home Tommy Smith’s pinpoint cross. Albion made a bright start in the second and so nearly went ahead again on 57 minutes. Knockaert, who was making his home debut, saw his 20-yard curling free-kick strike a post and go wide. Knockaert was proving a constant menace for the Huddersfield defence and he bagged a second assist as Brighton went ahead for a second time on 66 minutes. The wideman ran at the Terriers defence before whipping a fine left-foot cross for substitute Wilson to head home from close range. Albion almost handed Huddersfield a way back in three minutes later but Bunn and Wells both saw efforts blocked by Albion skipper Bruno. Things got worse for the visiting side with seven minutes left to play as Smith received his second yellow for a reckless lounge on Kazenga LuaLua. It was all Albion now and Andrew Crofts curled a right-foot strike just wide a minute later. Huddersfield pushed men forward late on and Wells curled a late free-kick just over as it ended 2-1. BRIGHTON: Stockdale; Bruno, Dunk, Goldson, Ridgewell; Knockaert, Stephens (Crofts 45), Kayal, Murphy; Zamora (Wilson 57), Hemed (LuaLua 62). Subs: Maenpaa, Calderon, Crofts, LuaLua, Towell, Wilson.